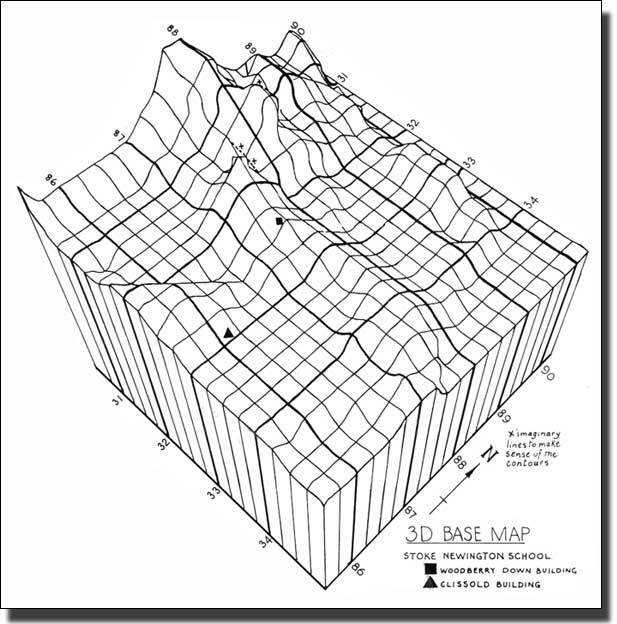 This is a 3D map showing hills and dales. It was produced by finding the x, y, z, co‑ordinates of the heights, on a 20x20 grid, from a standard contour map. These were then fed into a computer, which drew this map as a floating grid. The process is very expensive as it is so time consuming. However, there may be a cheaper way by using a digital plotter. Turn a standard contour map at 45°. Trace round the highest contour lines with a digital plotter or on tracing paper. This is an arm with a cross‑hair cursor. The position of the cross‑hair appears on a computer screen. Reduce the vertical height compared to the width. Move the cursor arm down the board or move the map up. Perhaps a programme could move the contour down. Trace the next contour lines. These will appear lower down on the screen and begin to give a 3D effect. Try not to go inside the top contour. Delete if necessary. Repeat 4 and 5 as often as desired. If necessary, make a good master copy from the computer print‑out, for all future photocopying.